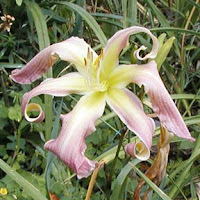 CHIN WHISKERS (McRae) 1992 DOR DIP Dusty rose UFo with large undefined and brush-stroky chartreuse green throat and thick lighter colored creamy midrib. Gently recurved form with big open 1/8” ruffles. Excellent bud count and northern rebloom with extended bloom. Has produced some wonderful seedlings. Early midseason. 5” bloom, 30” scape. 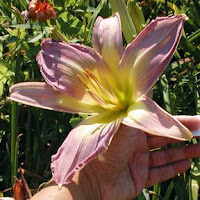 SEEDLING #36 (Cerulean Star x Stargate Portal) First year bloom. This picture is somewhat lighter in color than what the average blooms looked like but you get to see more of the structure. Dark purple open form with lots of quilling, twisting and turning of sepals. Bluish eye and green throat surrounded by cream. Around 3 foot tall scape. Two way branching. 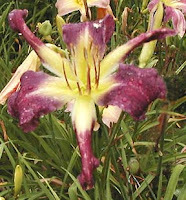 PEPPERMINT ICE (Lovell) 2004 SEV DIP (Top Billing X Joan Senior) Cream and white blend with magenta striping and what appears to be stippling. Yellow throat fading into a green heart. Very fast increaser, good foliage. Very unusual. Early midseason, 5’ bloom, 15 buds, 22” scape, 3-way branching. Will throw stripes and broken colors to kids. SEEDLING #51 (Julias Choice x North Wind Dancer) Very wide bloom, about 7 inches wide on average but had a couple at 9 inches, nice quilling and curling under. 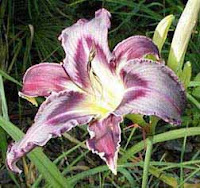 Lavender color with darker veining, good green throat surrounded by cream. Average height, average bud counts. SEEDLING #99 (Dallas Star seedling x Trahlyta) Medium-tall, clear lavender with a creamy watermarked eye, which you can't really see because of how the light was hitting the bloom. My hand is there to just tip the bloom out of direct sunlight. Olive green throat. 6" bloom. Average budcounts but very good scapes. SATIN BIRD (Childs) 1982 DOR DIP I've seen pictures of Satin Bird with a range of color from a clear raspberry to a more reddish purple as it appears in my garden. Open form triangular shaped bitone with narrow petals. violet with a darker violet triangular eyezone surrounding a lighter watermark. Occasionally produces very late blooming kids. Like Trahlyta, it does not necessarily produce eyed kids. Midseason. 6-7” bloom. 35-28” scape. SEEDLING #72 (Starmans Quest x True To Whim) A small bloom maybe 4 inches across, very delicate crispate. Clear colors of red purple with a hint of a blue eye surrounded by white. Green heart surrounded by a yellow throat. ZUNI THUNDERBIRD (Ned Roberts) 2003 SEV DIP (parentage unknown but pod parent is Talon) UFo crispate. 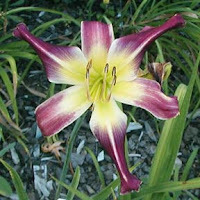 Dark wine red with extended yellow throat and green heart. 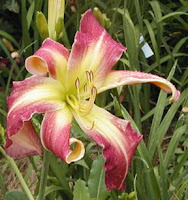 The sepals twist and turn gracefully on each bloom. Elegant ufo form that has lots of personality. Ned wrote: I wish it had wider distribution. It is one of my curliest intros and the green throat ranks as one of my greenest. ZT is one of the parents of Licorice Twist. ZT has an awesome gene pool and passes on the curly form and green throat. The dark color is dominant. Midseason, 7” bloom, Bud count of 16. 31” scape. SEEDLING #93 (Holly Dancer x Helga Bjornerud Burkey) Great budcounts, nice open branching and lots of scapes with this seedling. I've kept this one 3 years as a bridge plant. 6+" blooms. 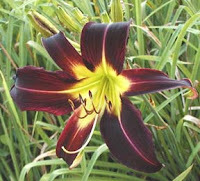 Darkest velvety red-purple with even darker veining and a green throat. FLUID DYNAMICS (Linda Michaels) (Prague Spring' X Trahlyta) 2007 If it's from Linda Michaels, you know it has superb performance, great branching and budcounts. Pinky lavender and a good green throat with my favorite attribute being the tight spooling up of the sepals. It can spool them up a lot tighter than this picture shows. And best of all, it does pass this trait on to the kids in varying degrees. Petals pinch in a charming fashion - this is a really fun plant. 6" blooms, 33" tall scapes. 2 laterals and 24 buds average. SEEDLING #148 (Wilson Spider seedling x Orchid Corsage) A rose bicolor with a darker rose eye and pale pinky-lavender edges. Darker veining and a chartreuse green throat. 5 inch open form bloom and average height and budcount. 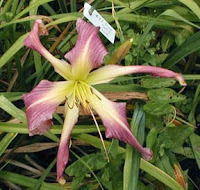 SEEDLING #103 (Pink Super Spider x North Wind Dancer) I really like what Pink Super Spider throws when put with narrower plants. 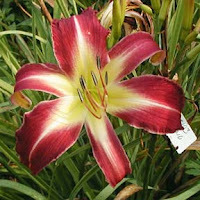 A clear lipstick red bloom about 5-6 inches, good green throat surrounded by a near white to cream halo. Petal tips curl under. Average height.